The embodiment of paradise, with endless stretches of white sandy beach and crystal-clear azure waters, our holidays in the Maldives are perfect for relaxation and discovery. 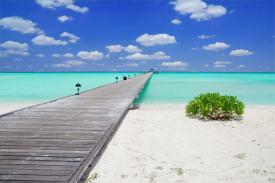 This beautiful archipelago is made up of hundreds of coral atolls and islands. Most are uninhabited but others have been transformed into some of the world's most spectacular beach resorts. 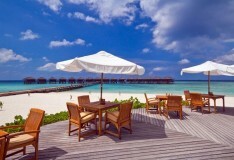 Maldives holidays really are a taste of heaven on earth. Surround yourself with the wonder of warm, deep blue seas, turquoise reefs, white sandy beaches and palm trees, swaying gently in the breeze. This is perhaps one of the most idyllic places in the world to watch a sunset, to feel totally at ease, and to take time to relax and unwind. You'll also find plenty of fun things to do on your holiday to the Maldives, not least the vast array of watersports and water based activities on offer. 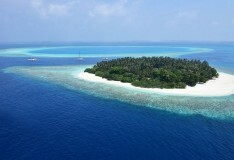 You might want to spend some time snorkelling for example, or perhaps improve your skills windsurfing or on-board a catamaran, and the Maldives is also a popular destination for surfers, with enthusiasts flocking to the North and South Male Atoll. 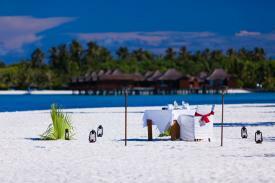 With such perfect natural surroundings, for many a holiday in the Maldives is all about wellbeing and relaxation. You'll find plenty of world class spa facilities on offer, with delightful surroundings and treatments that utilise traditional techniques. 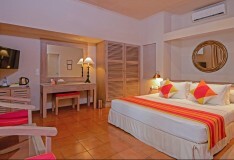 Spending time in the spa is a wonderful way to experience pure pleasure on your Maldives holiday. 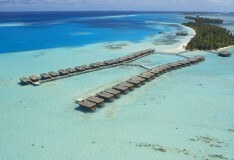 Our selection of luxury Maldives hotels gives you plenty to choose from when you're planning your holiday in paradise.